Test your gemstone and mineral knowledge with the following quiz this Easter weekend. 1. What is the connection between a surgeon's scalpel and a top chef's knife? 2. What is the second most abundant mineral in the earth's crust? 3. And the most abundant? 4. To which mineral does the semi-precious stone Blue John belong? 5. Where is it mined? 6. St Edward's Crown is the crown used at the point of coronation in Britain. In what year was it permanently set with semi-precious gemstones? 7. The Imperial State Crown is used after coronation as the monarch leaves Westminster Abbey. What is the "Black Prince's Ruby" centre front? 8. What is another word for rutilation in black rutilated quartz? 9. Which semi-precious gemstone is often found with malachite? 10. What is the name of the world's largest top quality white diamond? 1. Obsidian - a hard volcanic mineral which creates the sharpest cutting edge. 3. Bridgmanite - recently discovered hundreds of miles beneath the earth's crust. 5. Treak Cliff Hill, Castleton, Derbyshire. 7. Not ruby but Spinel or Balas. It was given to Edward, Prince of Wales (the Black Prince) by Pedro the Cruel King of Castile for helping him beat a rival in battle. Founded by Gustav Fabergé (1814–1893) in 1842, this iconic company was transformed by his son Peter Carl Fabergé (1846–1920) into an art jewellery specialist. Faberge became the leading jewellery supplier to the Russian Romanov Court - the royal family - and an international symbol of luxury. Faberge has been associated ever since with its Imperial Easter Eggs a few of which are pictured above. Faberge eggs were made of silver, gold, lapis lazuli, jade, malachite, diamonds and more semi-precious gems. Their intricate beauty displays talented use of goldsmithing, filigree work, cloisonné enamelling and handling molten glass. Whilst known first and foremost for their exquisite eggs, Faberge also made jewellery. The House of Faberge made 150,000 pieces of jewellery art and employed dozens of master craftsmen, not to mention over 500 workers in their showrooms in St Petersburg, Moscow, Odessa, Kiev, and London. The Faberge brand and name has stood the test of time and is greater than Tiffany, Aspreys and Cartier. We have Tsar Alexander III to thank for the birth of the Faberge Easter eggs. He commissioned Carl Faberge to create an Easter egg for his wife Empress Maria Fedorovna. The finished item was a triumph - an outer shell enamelled in gold to look like a real hen's egg opened to reveal a gold yolk, which itself opened to reveal a gold chicken. This also opened to reveal a replica Imperial Crown from which a tiny ruby egg was suspended. This first egg was so successful, he commissioned an egg for his wife each year, a tradition which was followed by Tsar Nicholas II. The tradition ended with the Bolshevik Revolution in 1917. In November 2007, the Rothschild Faberge Egg was auctioned at Christies for a record £8.98 million. If this is a little beyond your means, a piece of Booth and Booth jewellery is a great second choice! As January recedes and February appears on the horizon, the world of semi-precious gemstones turns away from garnet and on to amethyst. 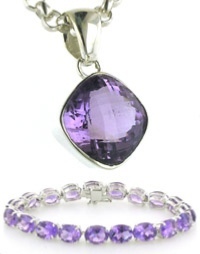 Amethyst is the February birthstone and as such is an ideal gift for someone with a birthday next month. Amethyst is one of the most popular semi-precious stones and it's easy to see why. Amethyst, which is quartz, is abundantly available in a wide variety of purple shades from the palest pinky lilac to the bold deep purple of royalty. It's available in all shapes and sizes and cuts which makes it a brilliant gemstone for use in jewellery. You'll find quite a wide range of prices. Cabochons, which are smooth polished amethysts, are usually the least expensive. Faceted stones tend to cost more and are available in many grades. Amethysts which are included (these are natural foreign bodies or disruptions inside the quartz) will be less expensive than premium eye clean stones. Nevertheless, there is beauty in an included stone which, when you look deep into it, displays it's long history. Premium grade amethysts are available in all sizes of gemstone including very large stones. These amethysts are clear, brilliant, even in colour and will glisten with other colours - often cerise pink. You'll find all of these types of amethysts in our amethyst jewellery collection. During this transition period from current website to new, there'll be some minor disruption in the appearance of certain pages. We're changing over some of the images so you may see different size images on the same page. It won't be long now, so bare with us! Our brand new website is off the drawing boards and now under construction. Designed with loving care and introducing a whole new shopping experience, we're hoping to knock your socks off! We'll be launching with a new Italian silver jewellery collection.